Installation by Laura Ramirez - Optika, Music by Ivan Panqueva. MAPPING FESTIVAL 2014 - VJ contest - 4th place in competition ! This year I had the pleasure to join the VJ contest at Mapping Festival in Geneva and get the 4th place in this renowned international competition ( some pics here: ), I have to say that I was very happy not only because I was selected and I passed to the final but also to see that south American VJ's rock the scene ! yes, the 1th place was for VJ Electroiman from Brazil and and VJ Chindogu from Uruguay got the 2nd. Thanks to the festival for the prizes and the good vibes, see you in 2015. People from VICE arrived to Colombia and in order to make a proper landing this group of talented people organized an event full of Music and arts, I had the pleasure to be invited to present my latest piece INTO THE VOID, the installation was successful and managed to captivate the audience who kept playing and interacting with the light, soon the video report. 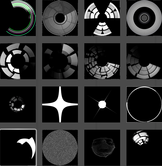 "VJ and video mapper Laura Ramirez shows us what she does for a living. She has participated in a great number of VJ events and mapping contests we've never heard of! After trotting the globe and working at iconic places such as Tresor in Berlin, she has finally come back home to share with everyone her knowledge and skills. (In Spanish)" Watch the presentation here. Only in spanish. 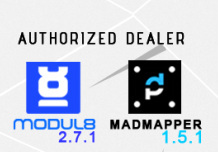 From now on I will be the authorized dealer for Modul8 and MadMapper licences in Colombia, so now you contact me to buy the standard and educational software at a special discount*. Sounds good right ? Cheers ! Back from NY I decided to organize a new project, something that I have had in mind since long time ago. 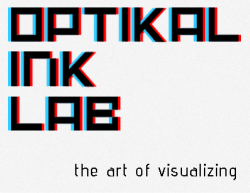 "Communication is only possible between equals" that phrase made me think that more people should know what I know about visuals and in that way expand my creative and professional circle, so I created OPTIKAL INK ACADEMY, a project that provides academic training to develop audio-visual proposals that integrate digital art and technology. The aim is to promote the audio-visual culture hosting events that offer and artistic and academic environment and so bring together professionals, colleagues and researchers who create projects related to the use of light, video projection and live performance. The first workshop was the .VJ . LAB . for beginners and curious people who want to know about VJ culture. Live cinema and live performance, HERE you can see the pics of our meeting ! Check it out the last review about my work at Create Digital Motion ! "Among superstar VJs, one favorite is Bogotá, Colombia-based Laura Ramirez, aka Optika VJ. " "Whether that’s fair or not about the scenes in general, it can certainly be said about Laura’s work: uptempo, mixing contrasting patterns, dynamic, and full of bold colors. And as such, such an injection of energy might be welcome anywhere around the world, as Laura does just that, spreading her work on tour beyond Colombia to venues international." INTO THE VOID . A JOURNEY OF LIGHT. "INTO THE VOID" is an installation that aims to provide the spectator with the sensation of traveling through a black hole. People are invited to stand in the middle of the installation and have a sound and light experience that is inspired by the speed of light and the quest for other dimensions of consciousness. I'm currently seeking festivals and galleries to host this work. Watch the teaser ! ENTER THE WALL is the first project in the public space developed by VIDEOLINER, a collective made ​​by Laura Ramirez a.k.a. Optika VJ and Jessica Angel . In this large-scale piece, we merge the mural painting with video mapping manipulated live and sound design. Thus we open new possibilities for experimenting with various disciplines, exploring the relationship between time, medium, location and purpose. Presenting this huge imaginary landscape, we want the viewer to experience the sense of wonder and immersion in front of a piece that shows a version of the world within the computer and how it is merged in a dynamic way with the city. AVENIDA PIXEL by Invasion Lab. Conceived as a collective, "Invasion lab." is collaborative group of friends, full of energy, that creates things that we love. This time, we decided to create an intervention in the walls and spaces of Bogota City in Colombia. Inspired by the idea of "Invade the city," we projected classic icons of our childhood, like Space Invaders and Psychedelic Squirrels (the Banner & Flappy cartoon), running over the city walls. We also displayed iconic symbols expressing opposition to violence and social problems, created by renowned graffiti Colombian artist "JuegaSiempre" (PlayAlways). Direction: Laura Ramirez a.k.a. Optika VJ. Audiovisual production : Ivan Garcia and Juampa Linares. Original Music: Ivan Panqueva. Collaboration : Marcelo Mejia A.k.a. Juega Siempre. Serie Pictogramas. Special thanks to Julian Medina, Sonia Yepes, Daniel Melo and all friends. © 2013 Optikal Ink Lab. All rights reserved.